Thanks to Nicole at Dula Notes, and also to Meatballs & Milkshakes for the twin inspirations behind this salad. It takes about 20 minutes to make, including prep time. One taste, and you’ll be hooked as much as I was. This recipe serves two, so you may have to adjust proportions if you’re faced with a gaggle of hungry eaters. You’ll want thick asparagus stalks, say about 1/4″ in diameter, or thicker. 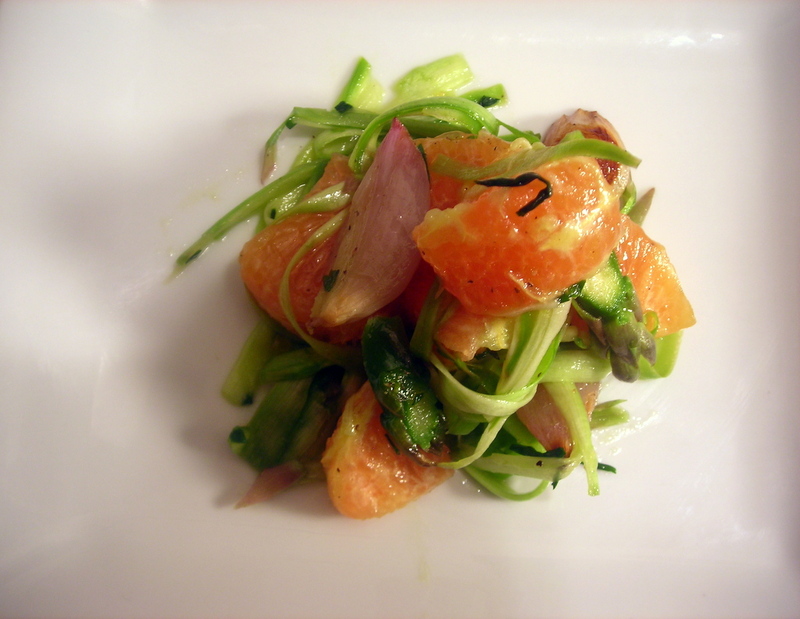 Part of the appeal of this salad is the textural contrast between the thin slivers of asparagus, the chunks of orange and the whole roasted shallots, as well as the intermarriage of sweet and tart. Although you can shave the asparagus with a sharp knife or a mandoline, you’ll achieve more consistent and better results with a vegetable peeler. In a small bowl, combine shallots, 1 tablespoon olive oil, the sherry vinegar and a small pinch each of salt and pepper. Stir to ensure that the shallots are well-coated with the vinaigrette. Transfer to a Pyrex baking dish or roasting pan and roast for 10 minutes at 375 F or until the shallots are slightly charred on one side and softened. Remove from heat and set aside until needed. Meanwhile, trim off 1/2″ from the asparagus stalks. Collect the ends and reserve for another use, such as asparagus stock. Trim off the tips, then slice them along a bias. Using a vegetable peeler, shave the asparagus stalks into strips. Place the asparagus strips and sliced tips into a large bowl. Add the orange chunks. Whisk together the remaining olive oil, white wine vinegar and honey (if using). If you substitute another sweetener such as agave nectar or orange juice, this dish becomes vegan. Taste for salt and pepper. Stir in chives. To assemble: Drizzle two tablespoons of dressing onto the asparagus mixture. Mix well. Mound asparagus and orange attractively on salad plates. Top each serving with a few roasted shallots. Serve at once. This is my second entry for Souper (Soup, Salad and Sammie) Sundays for the week of April 2, 2012 to April 8, 2012, a weekly foodblogging event organized and hosted by Deb of Kahakai Kitchen. 07 Apr	This entry was published on April 7, 2012 at 9:01 am. It’s filed under cooking, food, food photography, Gluten-Free, recipe, Souper (Soup, Salad & Sammie ) Sundays, spring, vegetarian and tagged asparagus, dinner, food photography, gluten-free, orange, salad, shallots, vegetarian. Bookmark the permalink. Follow any comments here with the RSS feed for this post. This looks like a tasty spring treat. I am having mixed feelings dropping by – I am trying to diet, yet everything you post is so beautful and delicious I can’t help but drop by! Even just to peek. Love your spin here! I’m sure the peeled asparagus does a nice job of soaking up the vinaigrette. Sounds wonderful. It’s definitely something that’ll be on my salad rotation. I’m also looking forward to giving the same treatment to zucchini when summer comes along. It was my pleasure, Deb, as always.